Chris Hondros/Getty ImagesJoseph Duo, a Liberian militia commander loyal to the government, exults after firing a rocket-propelled grenade at rebel forces at a key strategic bridge July 20, 2003 in Monrovia, Liberia. Government forces succeeded in forcing back rebel forces in fierce fighting on the edge of Monrovia’s city center. The first known photograph ever taken was by Joseph Nicéphore Niépce in 1826 or 1827, showing a view from a window of his home in France’s Burgundy region. In 1839, the first known photograph of a person was taken in Paris, showing a shoe shiner working on the Boulevard du Temple. But it wasn’t until Mathew Brady, known as the father of photojournalism, and his employee, Andrew Gardner, began shooting pictures of dead American soldiers on Civil War battlefields that the medium transformed the way people saw war. Since then, photography has both glorified and underscored the atrocities of conflict and war. Here are eight of the most iconic war photographs of all-time in chronological order. 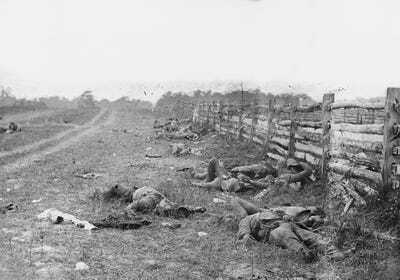 Alexander GardnerDead soldiers are photographed on the battlefield at Antietam in 1862. After the bloody Civil War battle of Antietam, Andrew Gardner took 70 shots of the dead in a field. It was the first time dead soldiers had been photographed on a battlefield. When Gardner later put them on display in New York City, the horrors of the Civil War, which before had only been seen in paintings, finally became apparent to Americans. 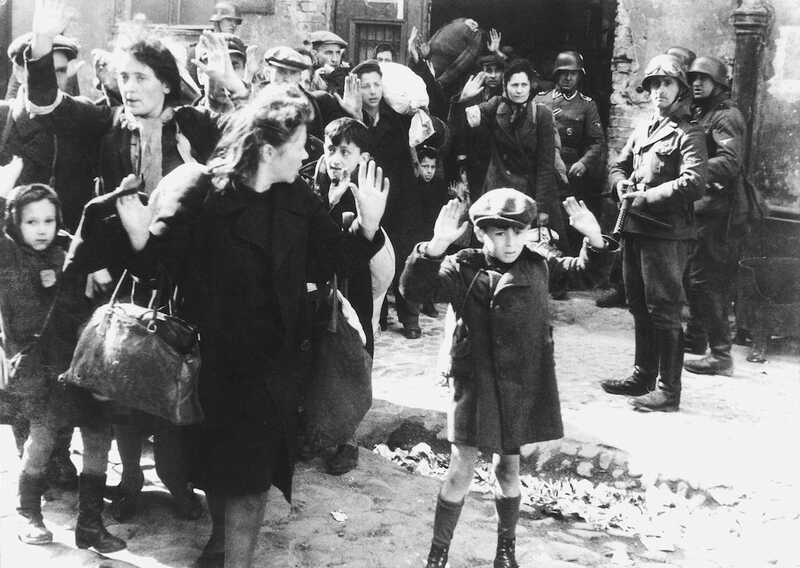 Wikimedia CommonsJewish people in the Warsaw, Poland, ghetto surrender to the Nazis in 1943. Likely taken by a Nazi photog named Franz Konrad, this photo shows Nazis rounding up Jewish people in the Warsaw ghetto. The 9-year-old boy in the picture may have been Dr. Tsvi Nussbaum, who later became a doctor in New York, but the claim was never proven. Photographer: Joe RosenthalFive Marines and a Navy corpsman plant a US flag after the bloody battle for Iwo Jima in 1945. 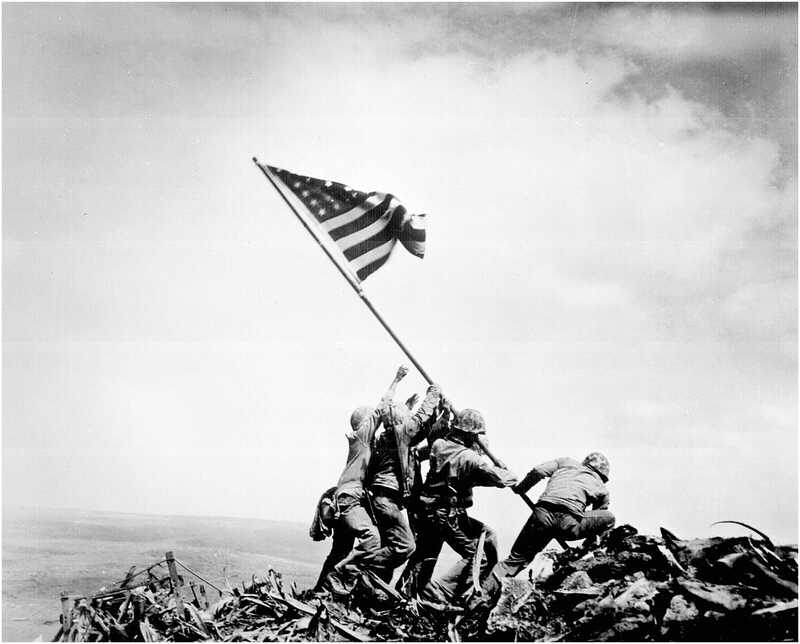 This photo by Joe Rosenthal of the American flag being planted on Iwo Jima may be the Second World War’s most iconic photo. Fifty years after the picture was taken, the Associated Press wrote that it may be the world’s most widely reproduced. Half of the six soldiers depicted died – among 6,821 Americans – on the very same island they claimed: Franklin Sousley, Michael Strank, and Harlon Block. Rosenthal received a Pulitzer Prize for the photo in 1945. Yevgeny Khaldei, Wikimedia CommonsSoviet soldiers plant their flag atop the Reichstag to conclude the Battle of Berlin and cement the fall of Nazi Germany. 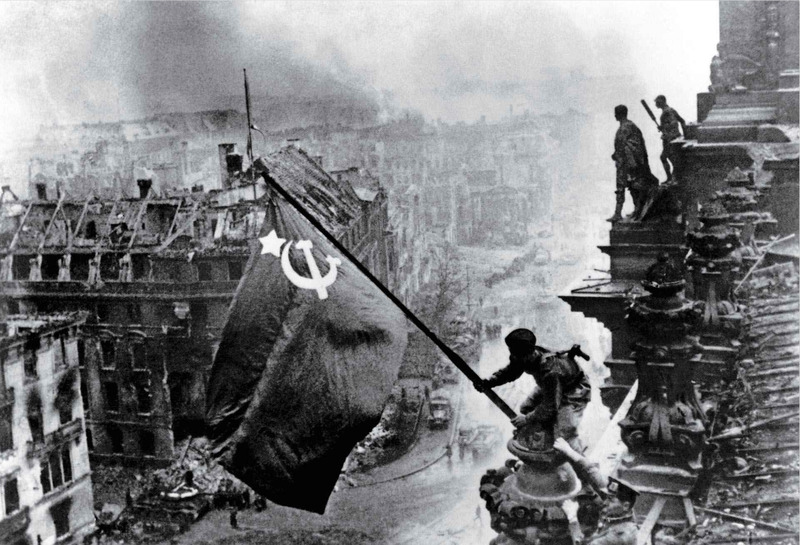 This was the Red Army’s “Iwo Jima” moment: Soviet troops fixing the flag of the Soviet Union atop the Reichstag to conclude the Battle of Berlin. 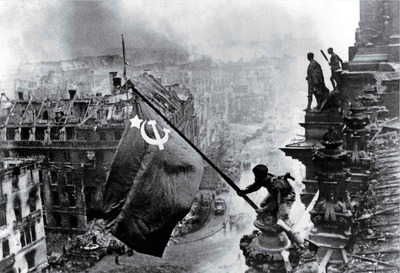 On May 2, 1945, Soviet photographer Yevgeny Khaldei snapped the now-famous photo of Alyosha Kovalyov and Abdulkhakim Ismailov raising the hammer and sickle over the Reichstag. But the truth behind the photo, who was in the photo, and who actually raised the Soviet victory banner, was muddled by the Russian propaganda machine for decades. Taken by Eddie Adams, this photo shows South Vietnamese Gen. Nguyen Ngoc Loan executing suspected Viet Cong officer Nguyen Van Lem in Saigon during the Tet Offensive of the Vietnam War. The photo was shown around the world and displayed at anti-war demonstrations in the US. “You can see the gun, you can see the expression on the man’s face as the bullet enters his head, and you see the soldier on the left who is wincing at the thing that has happened,” Hal Buell, who previously ran The Associated Press, told NPR in 2009. Adams won a Pulitizer Prize for the picture in 1969, but later wrote that the attention given to the picture disturbed him. Taken by Nick Ut, this photo shows South Vietnamese children running after a South Vietnamese plane accidentally dropped napalm on its own soldiers and civilians during the Vietnam War in 1972. The picture became symbolic of the atrocities of the Vietnam War, and Ut won a Pulitzer Prize for the shot in 1973. Phuc, now a 55-year-old Canadian citizen, runs a foundation that assists children injured and traumatized by war. 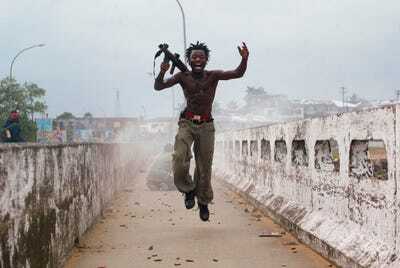 Chris Hondros/Getty ImagesJoseph Duo, a Liberian militia commander loyal to the government, exults after firing a rocket-propelled grenade at rebel forces at a key strategic bridge on July 20, 2003 in Monrovia, Liberia. In June 2003, Chris Hondros took this image of Liberian commander Joseph Duo after he fired an RPG at rebel forces during a battle in Monrovia during the Second Liberian Civil War. Hondros’ photos, along with the work of other photojournalists that summer, has been credited by many with helping stop the civil war. But Hondros himself later admitted in an interview that he wasn’t sure whether the photo glorified or condemned war. In January 2005, Chris Hondros captured this picture of 5-year-old Samar Hassan after US troops had accidentally killed her parents at a checkpoint in the Iraqi town of Tal-Afar. The photo ran in newspapers and media outlets around the world for days, forcing the US military to change how it operated checkpoints and further questioned the role of the US in Iraq. Hondros was killed in 2011 while covering the Libyan Revolution. The Falling Soldier by Robert Capa. American GI Moving Towards Omaha Beach by Robert Capa. Bloody Saturday by HS Wong (1937).